In 1834, the philosopher John Stuart Mill discovered that, although he had signed a contract with his publisher to produce a general history of the French revolution, he was actually too busy with other commitments to come up with the promised work. So he proposed to his friend Thomas Carlyle that Carlyle write it instead. Carlyle, struggling to make ends meet, and unwilling to stoop to mere journalism, took on the project with a fury — it was, he hoped, the work that would make his literary reputation. 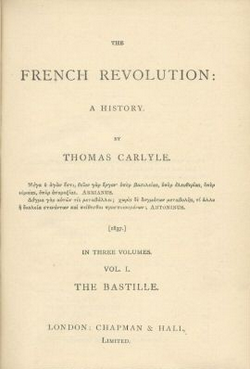 Throughout 1834, Carlyle slaved over his history of the French Revolution with passion late into the night. When he had completed Volume One, he sent it to Mill to for his review. On the evening of the 6th of March, 1835, Mill turned up at Carlyle’s house in Cheyne Walk, looking, Carlyle later wrote, “the very picture of desperation”. Mill had left the manuscript at the house of his friend, Mrs Taylor. Her servant, who could not read, had used it to light the fire. All that was left of Carlyle’s passion and fury were a few charred leaves. Mill brought the leaves, as confirmation. While most of us would greet this circumstance with hysteria and retribution, Carlyle was the epitome of politeness. Mill was beside himself with grief and self-recrimination. Carlyle probably offered him some tea. Mill offered to pay Carlyle for the damage, but Carlyle refused, saying that he could simply start again. Mill stayed very late, meaning that Carlyle, and his wife, Jane, had to stay up late, too, to comfort him. When Mill left, Carlyle’s first words to Jane were: “Mill, poor fellow, is terribly cut up. We must endeavour to hide from him how very serious this business is for us.” And it was serious. The Carlyles had no money, and Thomas knew he could never write that book again. He had destroyed his notes and could not remember what he had written: “I remember and can still remember less of it than of anything I ever wrote with such toil. It is gone.” He would have to tell Mill he couldn’t carry on. That night, however, he had a dream. His father and brother rose from the grave and begged him not to abandon the work. The next morning, Carlyle told Mill that he would take the money after all. He used it to buy paper, and started writing again. First, he wrote volumes two and three. Then, he recreated volume one. Carlyle wrote the entire manuscript from memory, words that came “direct and flamingly from the heart”. The three-volume work — a heroic undertaking which charts the course of the French Revolution from 1789 to 1795 — was completed and published in 1837. It has never been out of print and is still in print nearly 200 years later. Carlyle kept the charred leaves in his study for the rest of his life. This entry was posted in Burned manuscripts and tagged French Revolution, John Stuart Mill, Thomas Carlyle on 30 January, 2011 by Horatia.